Follow 22 west through Readington and continue until you first pass Potterstown Rd, then Blossom Hill Rd, then we are ahead on the right! If you hit Cokesbury Rd you have gone too far. Take route 22 (I-78) east to exit 18 and it merges into route 22 east. Continue through five traffic lights – shortly after the 5th light make a U-turn in the median – we are just ahead on your right. 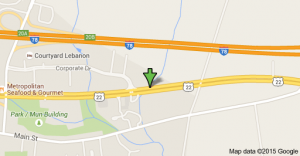 Take I-78W to West exit 20A – Cokesbury Rd. Continue 1/3 mile and make a left at the light onto US22 east. Pass through the first traffic light and make a U-turn in the median – we are just ahead on your right. Take I-78 east to exit 18 and it merges into route 22 east. Continue through five traffic lights – shortly after the 5th light make a U-turn in the median – we are just ahead on your right. Click the map for expanded interactive view.